Razer, the leading global lifestyle brand for gamers, has today announced that their award-winning lighting technology Razer Chroma will begin allowing a few select partners to connect their devices into the Razer Chroma ecosystem, bringing its full-fledged beauty to even more gamers. Razer Chroma is the world’s only immersive lighting platform with over a hundred natively integrated games such as Overwatch , Fortnite, Quake Champions , Diablo and other popular games. Razer Chroma also enjoys integration with Philips Hue smart lights, giving gamers a full-blown in-room ambiance that can be fine-tuned down to each individual light bulb, completely transforming the way they play. Until now, a common experience for many gamers today myself very irritatingly included is that the lighting effects on third-party devices such as PC cases, motherboards, and cooling fans are not fully in sync, producing an experience that is not in line with your other devices. 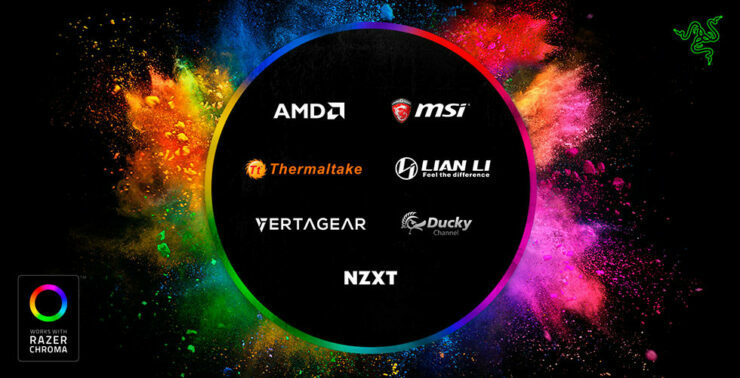 The Razer Chroma Connected Devices Program will enable partners such as MSI, NZXT, AMD, Thermaltake, Lian Li, Vertagear, Gigabyte, and Ducky the ability to tap into Razer’s lighting protocol through an API that lets them enable Chroma lighting through a single click on their software platforms. Razer Co-Founder and CEO Min-Liang Tan. With the addition of Razer Chroma into devices and components from eight additional partners, gamers will have the ultimate power to sync their favorite Chroma effects across their entire battle stations, even if they own devices from any of the partner brands. Overall this gives the RGB minded enthusiast a reason to choose Razer products over the competition and allow all of your devices to sync, although I much prefer ASUS’s implementation of RGB sync over all the competition. Razer has said The first third-party products with Razer Chroma support will launch in Q4 2018.